DA Form 2064 - also known as the "Document Register For Supply Actions" - is a United States Military form issued by the Department of the Army. The form - often mistakenly referred to as the DD form 2064 - was last revised on January 1, 1982. Download an up-to-date fillable PDF version of the DA 2064 down below or look it up on the Army Publishing Directorate website. DOCUMENT REGISTER FOR SUPPLY ACTIONS. 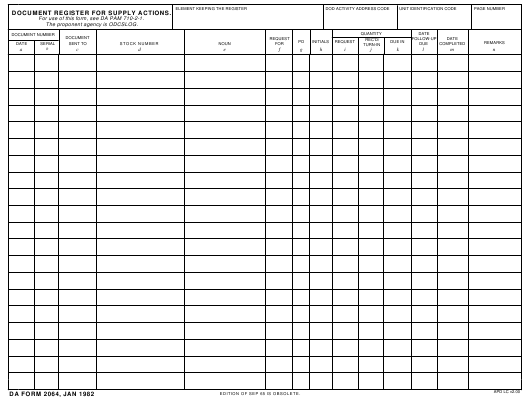 For use of this form, see DA PAM 710-2-1. The proponent agency is ODCSLOG. EDITION OF SEP 65 IS OBSOLETE.